My first impressions of the three tools was the exciting prospect of machinery that could be useful to woodturners who wish to decorate their turnings. The tools supplied come in very attractive presentation boxes with a clear panel in the lid, complete with a selection of burrs, discs etc. 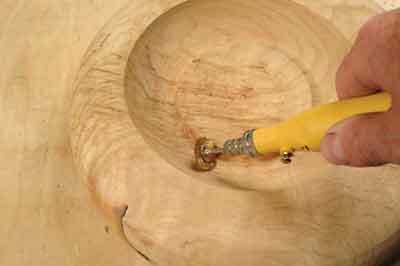 The machines, although aimed at the hobby market, are a useful entry-level tool for the woodturner wanting to do simple piercing and surface decoration. 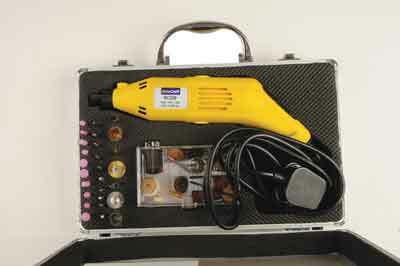 I took a look at three different Rotacraft tools: the RC200, RC 230X and the RC250. The smallest of the three but it packs quite a punch! The tool head is not too bulky, although continual use could prove fatiguing. The handset fits the hand well but speed adjustment was awkward. No speed indicator is fitted so guesswork must be employed or burning of tools and timber is the result! The machine is quiet even at the highest speed. I used the RC200 as a piercing tool through 1mm thick sycamore (Acer pseudoplatanus) which was fine, but sideways movement of the burr meant slow progress. A delicate touch is of the utmost importance here. 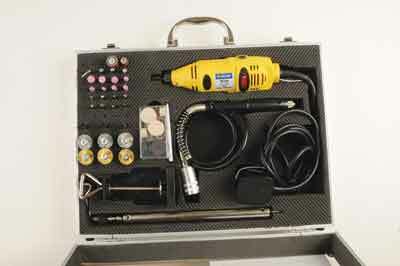 This is an engraving unit which can also cross over to be used for rotary power carving. Its slimline design enables it to fit in the hand well. The hand piece has the motor in it so the weight of it when holding pencil-grip style, will throw the top end into the crook of the finger and thumb, but it is well balanced and won't cause undue fatigue. The power delivery is not as smooth as the other models in this section, but then it is not priced at the same level. I could slow down the rotation of the sanding drum with less pressure than I could on the other models. This is an entry-level item for this aspect of carving and as such, it is a no-frills, but fully functional and easy to use, tool. It is a nice starting point for those venturing in, but if you get the bug for this type of carving, one is likely to want to upgrade soon, but this will still be a useful tool. This machine appeared to be my answer to a prayer; in many ways this machine fulfils that dream! I have often wanted a suspended piercer/engraver/sanding machine with a flexible drive. The flexible drive sported by the RC230X is a little stiff but practice makes it more efficient. The only real difficulty experienced was trying to hold the workpiece in my left hand with the handset in my right whilst trying to change the speed. In order to adjust the machine, I had to put down the handset and switch it off manually at the plug. In the interests of safety, I would suggest that all the models tested would benefit from a simple foot switch. This power tool is a squat and chunky little fellow, but surprisingly well balanced. It suits an overhand grip better than a finger grip, which can only be used for a short time before fatigue sets in, but rig-up the hanging pole and the flexible drive, and this is solved quickly - fine-detail work for extended periods becomes no problem. It sports a collet type bit receptor and has a spindle lock, so fitting accessories is no problem. The speed is changed via a sliding switch on the top of the body. It functions well with the accessories supplied, but I could slow it down quickly with light pressure with the 45mm cutter. I liked the mix of this set and it makes for a nice starter kit. The powered handset was obviously slightly heavier than the RC200 but is more easily controlled. It can be hung up between bouts of usage. Noise was not intrusive even in a closed room although prolonged exposure could be tiring. The machine took most things in its stride and hardly baulked when pressure was applied with piercing burrs. The machine is fitted with an LCD readout that makes repeating a speed much easier. 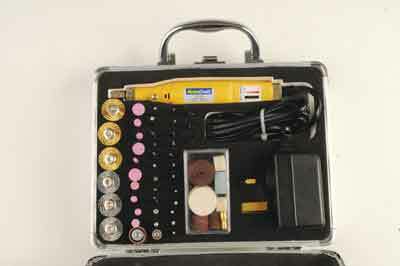 This kit is the only one with a decent box for accessories, many of the additional burrs, cutting discs etc. are easily lost once removed from the packaging. A compartmentalized case for these items makes it so much easier. All of these Rotacraft tools are lacking in one direction – there are no listings of spare parts for either the machines or the accessories. If, like me, you are prone to losing screws on the workshop floor, you may find yourself in a pickle trying to describe it over the telephone! Note the different body styling of this unit from the others. It has a beefier motor than its sister RC230 and as such, packs more of a punch for the more mid-sized shaping projects. I could slow it down with the 45mm cutter but a lot more pressure was required to do so. The accessories supplied are a good mix to get you started but as with all of the units shown, other accessories will need to be bought that suit the projects you will work on. The carry case is nice and keeps everything in one place, and is a nice touch. It is not the most stylish or elegant piece of kit, but works well and delivers a nice amount of power.